Anju Bobby George leapt to 6.53 metres in her sixth and last try to land the women's long jump gold, Anil Kumar heaved the disc to 60.68 metres to lift the men's discus gold while Shobha J. Jagdeeshppa cantered away with the heptathlon gold on a day of triumph for hosts India in the Afro-Asian Games athletics championship at the GMC Balayogi Stadium here today. 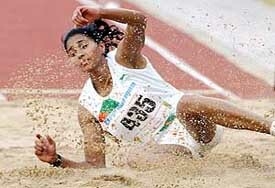 Anju Bobby George lands on sand during the women’s long jump event on Wednesday. India will clash with Pakistan in the men’s hockey final of the first Afro-Asian Games to be played here on October 31. In one of the most thrilling encounters, India edged out Malaysia 6-4 via sudden death while Pakistan downed Korea 2-0 in the semifinals at the Gachibowli stadium here tonight. Their confidence sky-high after the stunning win against South Korea in the semifinals, the Indians would have to ensure that they keep their winning momentum going against an in-form South Africa in the women’s hockey final of the Afro-Asian Games here tomorrow. England and Manchester United defender Rio Ferdinand leaves his home near Manchester on Wednesday. Manchester United beat Leeds United 3-2 in their League Cup third round match on Tuesday. Top-seeded Indian pair Mahesh Bhupathi and Rohan Bopanna outplayed Adelo Abadia and Johnny Arcilla of the Philippines in straight sets to storm into the tennis doubles final at the Afro-Asian Games here today. Hosts India scripted another memorable chapter in their football history, defeating Zimbabwe 5-3 to enter the final in the first Afro-Asian Games at Lal Bahadur Stadium here this evening. In the title clash billed for October 31, they will meet Uzbekistan, who beat Rwanda 2-1 in the second semifinal played at the Goshamahal stadium. Star striker Baichung Bhutia, who scored two goals in the semifinal against Zimbabwe in the Afro-Asian Games on Wednesday, is among the few Indian footballers who are destined to leave an indelible mark on the minds of the younger generation. India hit the golden trail at the shooting range when Rajyavardhan Singh Rathore and Anjali Ved Pathak Bhagwat won gold medals in the Afro-Asian Games shooting championship at the Hyderabad University range here today. Anjali Vedpathak Bhagwat poses for photographers after the women’s 50 m sport rifle three position event on Wednesday. Hyderabad is a city of artistically designed mansions, many owned by NRIs, and multi-storeyed shopping plazas. Theatre complexes like Imax on Tank Bund Road are a major attraction. With six theatres under one roof, Imax is a major source of entertainment. The minimum price of tickets is Rs 60. HYDERABAD: Star shooter Anjali Bhagwat and long jumper Anju Bobby George excelled as India gave a huge boost to their medal harvest with a haul of five golds to climb to the fourth position on the medals table after the fifth day of competitions in the inaugural Afro-Asian Games here on Wednesday. Having suffered a reverse in the first match against India, Australia struck back with vengeance, registering a comprehensive eight-wicket victory over New Zealand in the tri-series match at Nahar Singh Stadium here today. Set a target of just 98 to win by the Black Caps, the Australians galloped to victory, reaching 101 runs for the loss of two wickets in the 17th over. When I mentioned yesterday that a few overs at the Nahar Singh Stadium could change equations between the two teams, I admit not foreseeing such extreme fluctuations. To give you a synopsis of whatever brief action that took place on Wednesday, it was thoroughly disappointing show by the New Zealand team. Aussie one-day skipper Ricky Ponting won the International Cricketer-of-the-Year and Batsman-of-the-Year Awards while Indian batting maestro Sachin Tendulkar bagged the Cricketer-of-the-World Cup Award. Nasser Hussain and Rikki Clarke steadied England with an unbeaten century stand as they closed on 237 for four against Bangladesh after the first day of the second Test. The obdurate Hussain was on 47 and all-rounder Clarke on 53 not out after the visiting team had lost four top-order wickets for eight runs to slump to 134 for four. Put in, England’s opening pair had put on 126 before Marcus Trescothick (60), Michael Vaughan (54), Mark Butcher (6) and Graham Thorpe (0) all fell within five overs. 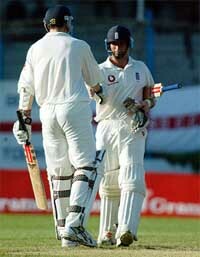 English batsman Nasser Hussain (R) congratulates Rikki Clarke after Clark reached his 50 on the first day of the second Test against Bangladesh in Chittagong on Wednesday. Haryana were bundled out for 233 in their first essay against Punjab on day one of a league match of the North Zone inter state cricket tournament played at the Dhruv Pandove stadium here today. At the draw of stumps, the hosts were 21 for one. Amritsar (men) and Ludhiana (women) won the titles at the 32nd Senior Punjab Handball Championship after thrashing Ludhiana and Amritsar, respectively, here today. India junior cricket team leaves for Pakistan. Anju Bobby George leapt to 6.53 metres in her sixth and last try to land the women's long jump gold, Anil Kumar heaved the disc to 60.68 metres to lift the men's discus gold while Shobha J. Jagdeeshppa cantered away with the heptathlon gold on a day of triumph for hosts India in the Afro-Asian Games athletics championship at the GMC Balayogi Stadium here today. On day two of athletics, India collected three gold and as many silver and bronze medals. The spotlight was on Olympian Frankie Fredericks of Nambia, who showcased his prodigious talent to run an effortless 200 m to win gold. Running on lane four, Fredericks shot off the blocks like a bullet to hit the wire in 20.57 seconds. Fredericks, whose personal best is 19.68 seconds clocked in Atlanta in 1996, elevated the stature of the games with his presence and was modest in his moment of triumph. Anju Bobby George's gold came as welcome relief for India after finishing at second and third positions yesterday. Anju recorded her winning jump of 6.53 metres in her last attempt, after a sequence of 6.48, 6.43 and 6.48 in her first three leaps. She fouled her third and fourth jumps, but got it right in the sixth, though the distance measured, 6.53 m, was nowhere near her best of 6.70 m recorded at the World Championship in Paris to win the bronze. Lerma Eumira Gabito of Philippines lifted the silver by clearing 6.30 metres in her second attempt while Agatise Esther of Nigeria bagged the bronze, also clearing 6.30 metres, but in her third attempt. At the discus pit, Anil Kumar brought off a quiet triumph with an effort of 60.68 metres on his third attempt, which overhauled his personal best of 60.65 metres. Ugmu China of Nigeria picked up the silver by recording 58.27 metres in his third try while El Ghaly Oumar of Egypt took the bronze. Shobha Jagadeeshppa Javur provided the third gold for India when she totalled 5884 points to finish first in heptathlon, the multi-event competition for women, while Soma Biswas took the bronze by logging 5532 points, to finish behind silver medallist Robbeson Justine of South Africa (5587). Jasmine Kaur of India annexed the silver in the 10 km walk with a time of 51:36.60 minutes while Bahia Boussad of Algeria lifted the gold (51:23.70) and Estle Viljoen of South Africa the bronze (52:1.30). Saraswati Saha ran an impressive race to bag the silver for India in the women's 200 m, clocking 23.43 seconds, while Delphine Bartill Atangana of Cameroon lifted the gold with a time of 23.37. Saraswati ran neck and neck with Atangana, but the latter stepped on the pedal at the home stretch to hit the gold. Geraldine Lititia Pillay of South Africa won the bronze. Arun D'Souza displayed a lot of grit and determination to keep pace with John Kemboi of Kenya to win the 3,000 steeplechase silver with a time of 9:05.97 seconds while Kemboi clinched the gold, clocking 8:56.43. Kemboi pulled ahead in the final round to create a gap of almost half a lap from D'Souza as he raced to the gold. Joel Kiptanui Chelimo of Kenya took the bronze. Arun, the best steeplechaser of India, however, has a personal best time of 8:54.0 seconds. Jagdish Bishnoi picked a bronze for India in the men's javelin with a heave of 75.34 metres in his fifth try. Piennar Hardaus of South Africa measured 84.50 metres in his last attempt to land the gold while Li Rongixang of China (79.01) collected the silver. Karamjeet Kaur of India finished sixth in the pole vault, which was won by Zhang Na of China, by soaring over 4.10 metres. Yan Wyk Annelie of South Africa claimed the bronze. India won the bronze in the 4x100 m men's relay while Africa and Senegal accounted for the gold and silver, in that order. However, Indian women ended up fourth in the 4x100 m relay, which was won by South Africa. Cote Divoire and Thailand took the silver and bronze. Oniosomiegbe Angela Atede of Nigeria cleared all hurdles in 13.18 seconds to win the gold in the 100 m hurdles while India's Priya Kadayam Natrajan finished seventh while Shobha dropped off at the half-way stage. Gulab Chand and Sunil Kumar took the seventh and eighth positions in the 1500 m race. Handicapped by the absence of full back Kanwalpreet Singh, who aggravated a hamstring injury in the match against Pakistan the other day, India fought with unbelievable team spirit but the crowding tactics adopted by the Malaysians thwarted their intentions. Despite repeated attacks, the Indian forward line failed to break the Malaysian defence and at times the entire Malaysian team fell back to defend their fort. Backed by a vociferous crowd, the Indians showed early promise and succeeded in taking the lead in the 20th minute when skipper Dilip Tirkey’s hit from the centre line was intercepted by Prabhjot whose subsequent hit was blocked by the Malaysian custodian. However, off the rebound, Arjun Halappa shot home (1-0). Malaysia did not take long to equalise. A penalty corner in the 22nd minute was utilised to the hilt by international Chua Boon Huat who hit the target with precision (1-1). The grim battle resumed with ferocity in the second half but a series of penalty corners earned by India failed to yield the desired result as Dilip Tirkey’s hits were blocked by the Malaysians time and again. Off a counter-atack, India’s Gagan Ajit Singh sent a measured cross to Deepak Thakur whose power-packed hit saw the ball landing outside the stadium. Again Prabhjot’s pass to Gagan Ajit was followed by the latter’s first-time deflection but the Malaysian goalkeeper palmed the ball away. Malaysia’s NK Silva Raja also had an opportunity when he raced in from the right only to shoot wide. Towards the end of regulation time, a penalty corner earned by India went waste as a Malaysian defender blocked Tirkey’s hit although the goalkeeper was beaten. A drag flick by substitute Len Aiyappa off yet another short corner also was well anticipated and blocked. With the tie remaining deadlocked,15 minutes of extra time was allowed which also failed to break the deadlock. And then followed the battle of strokes. As the Malaysians joined hands in a unique show of solidarity, the Indians knelt in prayer with the grim faced Rajinder Singh and Baldev Singh boosting the team’s morale through pep talk. India converted the first stroke through Arjun Halappa while KK Keevan Raj made it 1-1 for Malaysia. Bimal Lakra converted the second stroke but Malaysia’s Chuan Boon Huat, who had scored in regulation time, hit wide and India were up 2-1. Thereafter, India scored through Gagan Ajit Singh, Prabhjot Singh and Kanwalpreet Singh to send the visitors crashing out of contention. Overcoming Korean resistance, Pakistan shot into the lead in the 33rd minute when Ghazanfar Ali found the target off a short corner. In the second half Pakistan survived a strong Korean onslaught before consolidating the lead through Shakeel Abassi. Earlier in the play-offs, South Africa beat Nigeria 4-0 while Egypt edged out Ghana 1-0. Star Indian hockey defender Kanwalpreet Singh, who aggravated a hamstring injury in the match against Pakistan and did not play the match today, finally turned out to be the saviour when he was specially called in for the battle of strokes. With the score tied at 1-1 at the end regulation time and extra time, the sudden death rule came into force and Kanwalpreet was among the five players picked by coach Rajinder Singh to take the strokes. With India leading 5-4, the tall Punjab Police defender came to take the last stroke and beat the Malaysian goalkeeper hands down sparking wild celebrations in the stands. Assured of a medal, which according to chief coach M.K. Kaushik is “a big morale-booster for the new-look side”, a win tomorrow would go a long way in making them a strong contender in Asia Cup, the winner of which will automatically qualify for the 2007 World Cup. “We had come to this tournament primarily targeting a medal which was badly needed to boost the morale of the team consisting of several new players. Now we are just one match away from the gold medal,” Kaushik told PTI here today. India, who are here without five key players — Sita Gossain, Mamta Kharab, Pritam Siwach, Manjinder Kaur and Sabah Anjum — had a none-too-impressive start to the tournament. Though they beat minnows Ghana 8-0 in their opening match, they lost to South Africa 1-3 in the second game. Bhupathi, one of the top doubles players in the ATP list, and Bopanna went unchallenged by their unseeded rivals as the Indians scored a facile 6-3, 6-2 win in quick time in the one-sided match. Bhupathi, playing in his first match in the games, and Bopanna combined well and came up with some breathtaking volleys and booming serves as their opponents stood watching during most part of the tie. They had to be content with breaking the Indians once each in the two sets. Though Bopanna was broken in the second game of the first set, the Indians bounced back to break Arcilla in the very next game to level the scores. With breaks in the fifth and the ninth games, the top-seeded pair took the first set comfortably. Teen sensation Sania Mirza and her senior Rushmi Chakravarthy scored contrasting wins in the semifinals to set up an all-India summit clash in the women’s singles event. Sania overcame initial hiccups to defeat Czarina Arevalo of the Philippines rather easily 6-4, 6-1 while Rushmi quelled a strong fightback by Indonesia’s Sandy Gumulya 6-3, 2-6, 6-3 to assure India of a gold and silver each. The 16-year old Sania, the Wimbledon girls doubles champion, put up a below par performance in the first set as she struggled to hold her serve on many occasions besides having difficulty with her most potent forehand shots. But she tightened her game in the second set to notch up a straight set victory. Sania’s rival managed to put up a semblance of fight in the first set. But she made a lot of unforced errors and costly double faults on crucial points as the match turned out to be a one-sided affair in the end. Sania, who moved into the semis with a 6-1, 6-0 thrashing of Zimbabwe’s Fadzai Mawisire, began well holding her serve in the first game and broke Czarina in the next, but found herself in trouble at 0-40 in the third as her opponent came up with some good returns to break her serve. From there on the rivals traded breaks till the Filipino held her serve in the eighth and Sania in the ninth to go up 5-4. Sania held three set points in the next game and clinched it with her rival hitting her forehand long at 0-40. Improving her game, Sania broke Czarina in the second game of the second set and held her serves comfortably to go up 4-1. She had another break in the very next game before finishing in style with good deep serves in the seventh. “The first set was pretty tough. But I am happy with the win. It was a good practice match for the final,” said Sania after the match. Zimbabwe, with a world ranking of 48, were expected to pose a tough challenge to India, who are ranked 132 in the world but the soggy ground conditions made their task difficult. Incidentally the two teams faced each other for the first time today. After conceding an early goal, India hit back with vengeance through star strikers IM Vijayan and Baichung Bhutia, who scored two goals each, while Renedy Singh accounted for one although Zimbabwe managed to score two more in the second half to derive some consolation. Thrissur-born striker IM Vijayan, incidentally on his swan song, lead the Indian fightback along with Baichung Bhutia and the goals that they scored had class written all over them. Undeterred by the setback, India continued to press hard and on one occasion, skipper Baichung Bhutia was in a one-to-one situation with Zimbabwe goalkeeper Chenjerai Dube but Dube rushed out of charge to thwart the move injuring Bhutia in the process. However, India did not have to wait long to equalise. In the 25th minute a cross from the right corner by Jatin Bisht saw IM Vijayan shooting into the net with Zimbabwe goalkeeper looking on helplessly (1-1). In the 38th minute Vijayan again demonstrated his lethal firepower. After Climax Lawrence had centred, Vijayan turned around to head the ball home making it 2-1. With hardly four minutes to go for the lemon break, skipper Baichung Bhutia sent the spirits soaring with the third goal. Having entered the box unmarked, Bhutia turned around before shooting into the far corner of the net sending the crowd into raptures (3-1). Zimbabwe suffered a setback in the second half after Matora Asani was shown the red card for a dangerous tackle on Bhutia. A few minutes later India scored their fourth goal after Bhutia sent a cross to winger Renedy Singh whose powerful long ranger from 30 yards brooked no resistance (4-1). India made a couple of substitutions bringing in S. Venkatesh and Abhishek Yadav in place of Climax Lawrence and IM Vijayan even as Zimbabwe mounted pressure through Francis Madziva and Ronald Badza, but Sangram Mukherjee under the India bar effected some brilliant saves. A few minutes into the second session, Zimbabwe earned a penalty and substitute Edmore Mashiri found the target making it 2-4. But in the very next minute, India were also awarded a spot kick after Bhutia was brought down inside the box. Bhutia himself took the penalty and boosted the tally to 5-2. Zimbabwe mobilised all their resources towards the end and managed to cut the deficit when a cross from the right corner saw Simon Chipunza attempting a powerful header which landed in the net (3-5). Thereafter, the Indian defence did not allow the visitors much freedom. In the second semifinal, Uzbekistan beat Rwanda 2-1 in extra time after the two teams were locked 1-1 in the stipulated period. Uzbekistan took the lead through Saidov Mansurjon in the 63rd minute but Jimmy Mulisa’s equaliser in the 73rd minute brought Rwanda back on equal terms. Eventually in extra time, Boyev Konstantin Aliksandrovichi settled the issue in the 102nd minute to move into the final. From the maidan of Kolkata to the congenial environs of England’s second division outfit Bury FC and back , Bhutia has indeed come a long way. As an icon of Indian football, Bhutia represents the best in modern national football. His three-year stint in the English League where he rubbed shoulders with some outstanding world players brought about further improvements in his style. Hailing from a remote village in Sikkim, Bhutia also made Punjab his home a few years back when he joined JCT and helped his team win the first National Football League title in 1996-97. India hit the golden trail at the shooting range when Rajyavardhan Singh Rathore and Anjali Ved Pathak Bhagwat won gold medals in the Afro-Asian Games shooting championship at the Hyderabad University range here today. India collected two gold, one silver and one bronze today to raise their medals tally in shooting to three gold, four silver and two bronze. Though Rathore’s total of 174 (130 plus 44) in the double trap event was low by his standards, he had the satisfaction of inscribing his name in golden letters in the first continental games between Asia and Africa. Rathore, along with chief coach Prof. Sunny Thomas, had flown in to Hyderabad from Rome after participating in the World Cup only a day before the games began as he was keen to compete in it. He lived upto the expectation of Professor Thomas, who predicted yesterday that the Army Major was well-equipped to win the gold. Rathore made light of fading light and a wavering target machine to strike gold. Though Rathore’s title came on expected lines, Anjali sprang a surprise by hitting bull’s eye in the 50 m sport rifle three positions for women, as this was not her favourite event. Rathore and Ronjan Sodhi made a one-two in the double trap, winning gold and silver, respectively, while Kuheli Gangulee bagged the bronze in the 50 m sport rifle three positions. In double trap, Rathore put himself in a comfortable position with a score of 130 in the qualifying round, out of a possible 150, while second-placed Sodhi could gather only 123 points. M. Nicholson of Zimbabwe was ahead of Sodhi with 124 points. Another Indian in the fray, Morad Ali Khan, returned a score of only 111. In the final round, both Rathore and Sondhi hit 44 targets each, out of a possible 50, but Rathore got the gold for his fine show in the earlier round, to total 174. Sodhi finished on 167 while Nicholson totalled 162 (124 plus 38). Ali did better in the final round, with a score of 42, but it was too late for him to make amends for his low score in the qualifying round. “Winning is always good”, Rathore said, beaming from ear to ear. Rain in the morning, and an overcast sky made it a grey day and the fading light posed problems for the shooters. To compound their woes, the target machine also behaved strangely. “I was feeling a bit sleepy due to the starnge light”, Rathore said. “The targets were unsteady too as the machine seemed wobbly. We are dependent on the machine for the eventual result”, he added. Thomas felt that Rathore was capable of figuring among the medals at the Athens Olympics in 2004 if he could fire in the range of 143-144. “Rathore is one of the top six shooters in the world (in double trap)”, pointed out the chief coach. Anjali was not expected to hit the gold int he 50 m sport rifle three positions, but she came up with a commendable score of 675.5 to ensure the gold. She shot 98 and 98 in prone, 98 and 96 in standing and 90 and 97 in kneeling in the qualifying rounds to gather 577, and then had scores of 10.1, 10.3, 9.8, 10.6, 10.6, 9, 9.9, 8.8, 9.5 and 9.9 in the final rounds to total 98.5 for an overall tally of 675.5. Olga Dovgun of Kazakhstan shot 675 (579 plus 96.3) to lift the silver. Kuheli Ganguli brought home a surprise bronze with a score of 669.7 (572 plus 97.7). Anjali’s consistent display in the final rounds helped her pip Olga to the gold, though the Kazakh girl had a two-point edge going into the medal round. Hyderabad is a city of artistically designed mansions, many owned by NRIs, and multi-storeyed shopping plazas. Theatre complexes like Imax on Tank Bund Road are a major attraction. With six theatres under one roof, Imax is a major source of entertainment. The minimum price of tickets is Rs 60. The giant screen imported from Australia measuring 60 ft x 90 ft is as big as an eight-storeyed building. English, Hindi and Telugu movies are screened simultaneously. Ramakrishna Theatre owned by former Chief Minister NT Rama Rao also draws good crowds. The serene environment of the Indian School of Business is the ideal place to relax for the Indian hockey team after gruelling encounters at the Afro-Asian Games. Located a few kilometres away from the Gachibowli stadium, the sprawling complex with world class facilities is not easily accessible. Entry to the complex is restricted and conditional. Only after confirmation from inside are guests allowed to enter, though with certain conditions. Blowing of horns is prohibited and the speed limit is 30 km. A media get-together at Hotel Viceroy last night provided an opportunity to veteran and young journalists to interact with their foreign counterparts. Among those present were the president of the IOA, Mr Suresh Kalamadi, Secretary-General Randhir Singh, and Andhra Pradesh Sports Minister P. Ramulu. A book on Dhanraj Pillay written by freelancer Arumugam was also released on the occasion. Mr UN Narayana Murthy, senior sports journalist based in Hyderabad, is the moving spirit behind the impeccable media arrangements for the Afro-Asian Games here. Media centres, well equipped with computers and other facilities, offer ideal working conditions to journalists who have converged from various African and Asian countries to cover the Afro-Aisan Games. Mr KV Ramana Chary (IAS), convener of the media and publicity committee, takes personal pains to see that there is no cause for complaint. Bringing some solace to the otherwise barren day for India in weightlifting, P. Harita won a bronze in the women's 63 kg weightlifting championship at the KVBR indoor stadium. CRPF's Senthil Kumar came with India's lone medal from the pool as Richa Mishra and Nisha Millet finished fourth in their respective events on day which saw Japan winning two gold medals. Having suffered a reverse in the first match against India, Australia struck back with vengeance, registering a comprehensive eight-wicket victory over New Zealand in the tri-series match at Nahar Singh Stadium here today. Set a target of just 98 to win by the Black Caps, the Australians galloped to victory, reaching 101 runs for the loss of two wickets in the 17th over. The world champions were in full cry during the day. They batted, bowled and fielded with purpose and thoroughly outplayed their rivals in a lopsided contest. The spin of the coin was the only thing which went in favour of the Black Caps. After they chose to bat, they plunged headlong into trouble losing wickets sooner than expected. At 21 for the loss of five wickets at one stage, they faced the danger of being dismissed at their lowest-ever total against their rivals. As the game progressed the marauding Australians continued to strengthen their grip on the match and emerged comfortable winners. The stunning catch taken by Damien Martyn at square leg off a full-blooded hook shot, from the blade of Brendon McCullam exemplified the Aussie spirit and the urgency shown by the Australians during the day. Left-arm seamer Nathan Bracken started the rot in the very first over trapping opener Chris Nevin lbw, who was drafted into the side in place of injured all-rounder Chris Cairns, through a delivery which straightened after pitching. Bracken, the best bowler during the match against India, struck again getting the key scalp of skipper Stephen Fleming, who snicked an away-going delivery into the hands of wicketkeeper Adam Gilchrist. Brad Williams, who was a big disappointment in the previous match, then dismissed Lou Vincent, who went for a mindless heave and was caught by Andy Bichel. Williams, who was nippy thoughout, beat the bat regularly. The burly seamer scalped two more victims to finish with the career-best figures. He was later rewarded for his fine effort with the Man of the Match award. The slide continued as Williams and Bracken struck again as half the Kiwi side was back in the pavilion in just the ninth over! One-day specialist Chris Harris and Craig McMillan were then involved in the 52-run stand for the sixth wicket, the biggest of the innings, before Harris fell to seamer Ian Harvey. Harvey, who bowled a persistent line with his gentle medium pace stuff, then claimed the wicket of Daniel Vettori which hastened the batting collapse. Harvey finished with the most flattering figure of 8-2-9-2. The total of 97 runs put on the board was never going to challenge the mighty Australian batting. 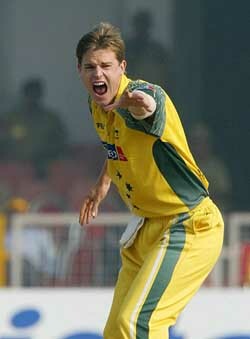 Adam Gilchrist started with a couple of boundaries in the first over bowled by Darryl Tuffey, which produced 14 runs. Gilchrist then lofted Tuffey over the mid-wicket fence for the first six of the match. Tuffey, who normally bowls with a nagging accuracy, was hammered all over the park by the rampaging Australian batsmen as bowler finished with the figures of 6.4-0-51-1, which the genial seamer would like to forget in a hurry. Mathew Hayden steered Tuffey to the mid-wicket fence effortlessly to complete his half century and seal the victory for his side. Fall of wickets: 1-0, 2-11, 3-11, 4-20, 5-21, 6-73, 7-77 8-80, 9-80. Bowling: Bracken 9-2-25-3, Williams 9.4-1-22-4, Bichel 7-0-29-1, Harvey 8-2-9-2. Fall of Wickets: 1-47, 2-90. Bowling: Tuffey 6.4-0-51-1, Oram 7-1-31-1, Hitchcock 2-0-8-0, Vettori 1-0-6-0. It may be just one of those off days when nothing goes in your favour, but to get it this much wrong needs some bit of an effort too. And that came in from Lou Vincent and Scott Styris, both getting out to some irresponsible and over-ambitious shots, totally unwarranted when your side is battling to play out the allotted 50 overs. It's not typical to see fast bowlers running through a side in India and already a lot has been said about the grass and bounce of the strip but I need to reiterate that there's no devil in the wicket. It played good and the true bounce was a welcome revelation in Faridabad. The heavy morning conditions and the early nine 'o' clock start did the trick for Australia and I wonder why someone like Stephen Fleming, regarded as one of the shrewdest skippers in international cricket, didn't have the guts to back his instincts and went for stereotype 'bat first' policy in India. He must have rued his decision but then, there's no use crying over split milk. Having said everything about the spineless Kiwi batting and how the conditions worked well for Ricky Ponting's side, it is important to put the ball in the right slot. Easily said than done, but Brad Williams and Nathan Bracken followed the basics to the hilt and were aptly rewarded. To me, Bracken was the bowler to watch. Improving with every outing, what was pleasing to note was his ability to swing the ball both ways. 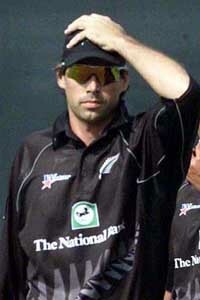 On Wednesday, Bracken made the ball to shape out for left-handed Fleming, something we missed that night at Gwalior. Williams too bowled with a lot of fire and was willing to bend his back and extract the maximum. Good sign for Australia that their back-up seam strength is potent to be match-winners on their own. If they continue in the same vein, surely Ponting won't mind McGrath, Lee and Gillespie going on a long vacation. I must add here that this may be the last time, Bracken and Williams are seeing some grass on the wicket and it will be interesting to see if a new confident Aussie attack can close on the rampaging India in trying circumstances. Announcing the awards, CEAT Limited vice-chairman Harsh Goenka told reporters here today that "we are delighted to honour the talents and hard work of the winners and celebrate their victory along with cricket enthusiasts across the globe. I congratulate our award winners and salute all those who have made it to the top in the Ceat cricket ratings," Goenka said. Match-winning performance: Mohammed Kaif and Yuvraj Singh. Nasser Hussain and Rikki Clarke steadied England with an unbeaten century stand as they closed on 237 for four against Bangladesh after the first day of the second Test. The obdurate Hussain was on 47 and all-rounder Clarke on 53 not out after the visiting team had lost four top-order wickets for eight runs to slump to 134 for four. Put in, England’s opening pair had put on 126 before Marcus Trescothick (60), Michael Vaughan (54), Mark Butcher (6) and Graham Thorpe (0) all fell within five overs. Clarke, batting as cautiously as Hussain, chipped slow left armer Enamul Haque jnr over mid-on for his eighth four to bring up a maiden half-century. Brief scores: Haryana: 1st innings: 233 all out (Pardeep Sahu 126, Sachin Rana 46, Ankit Rawat 31, Naresh Gogyan 4 for 60, Hardavinder Singh 3 for 64); Punjab: 1st innings: 21 for 1. In the men’s section, Amritsar routed Ludhiana 41-31. Sukhdev Singh and Baljit Singh contributed nine goals each for the hosts while Sukhjit Singh and Lakhwinder Singh scored seven goals each. For Ludhiana, Gaurav and Pawan netted seven goals each. In the women’s category, Ludhiana outclassed the hosts 29-23. For the visitors Gurpreet Kaur scored maximum 16 goals.